Nice motel ... The Room could have been better, and why do we have to pay for a extra bed! When the reservation is made for double queen separate bed.? Your stay with us includes free continental breakfast, WiFi, cable TV, a small refrigerator, iron, and free parking on site. The rooms have a private entrance with open community balconies. Our front desk is open and available 24 hours, 7 days a week. All 50 rooms are non-smoking. We have a designated smoking area. No pets are allowed. The Shalimar Motel was designed by Edwin Reeder in 1951 and is one of the most Significant structures in Miami’s historic Miami Modern MiMo district. A total renovation was completed in 2012/13. 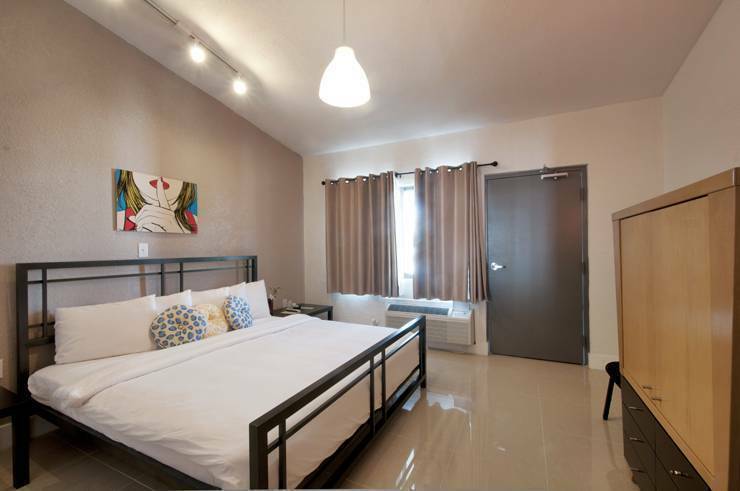 Our 50 air-conditioned guestrooms were totally renovated in 2013. 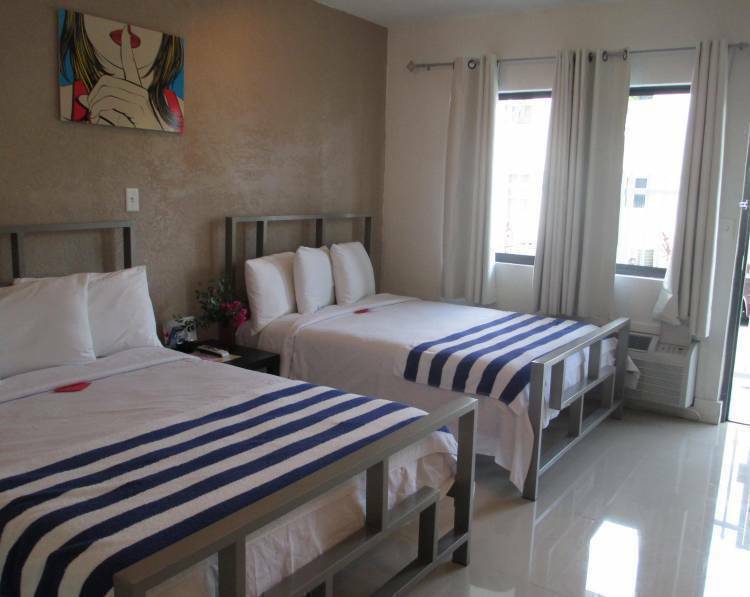 We provide clean, modern rooms with comfortable furnishings, ceramic tile floors, all white bedding at affordable prices. QUEEN DELUXE, Room Description: One queen size bed. Accommodates up to two (2) adult only. Additional fees will apply for adding a cot (small bed) from $ 10. 00 to $ 25. 00 per night. Non smoking only. + $ 5. 00 service charge per person per night. + $100. 00 refundable security deposit, subject to extreme cleaning, including in room smoking. KING DELUXE, Room Description: One king size bed. 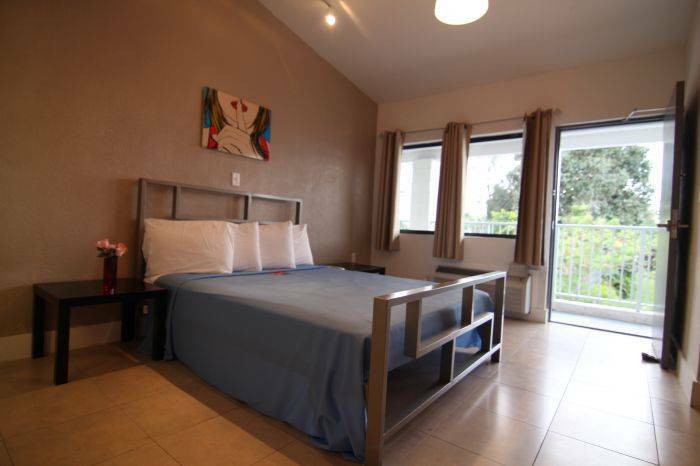 Accommodates up to two (2) guests + one child only, up to 10 years old using the existing bed. 2nd. child per a night by adding a cot (small bed) is $ 25. 00 per night. Non smoking only. + $ 5. 00 service charge per person per night. + $ 100. 00 refundable security deposit subject to in room smoking or any other damages (extreme cleaning). DOUBLE DELUXE, Room Description: Two double beds. Accommodate strictly up to 3 adult guests. NO extra beds are permitted in double deluxe rooms. $ 5. 00 service charge per person per night including children. non smoking only. + $ 100. 00 refundable security deposit at check in time, refunded at check out subject to in room smoking or damages. + $100. 00 security deposit at check in time refunded at checkout time. Refunds are subject to in room smoking & damages including extreme cleaning. discarding items, bedding stains, smoking in room, or damages to furnishings, missing items will be charged accordingly from the security deposit. Front Desk opens 24/7 with staff to serve your needs. The entire property is secured 24/7 with multiple surveillance cameras. The Shalimar Motel is located In the Miami Modern MiMo district, minutes away from the famous Miami Art and Design Shalimar Motel was designed by Edwin Reeder in 1951 and is one of the most Significant structures in Miami’s historic Miami Modern MiMo district. A total renovation was completed in 2012/13. The Shalimar Motel is located in the historic Miami Modern MiMo district in Midtown Miami. 7 miles from Miami Beach convention center, and the world famous South Beach (Lincoln Rd), shopping, restaurant nightlife and clubs. 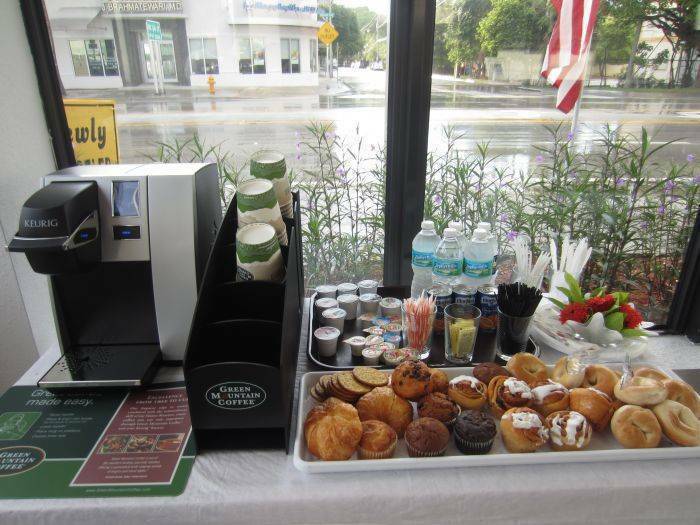 6 miles from the Miami International Airport and the Port of Miami. 2 miles from American Arena and Bayside Market Place. 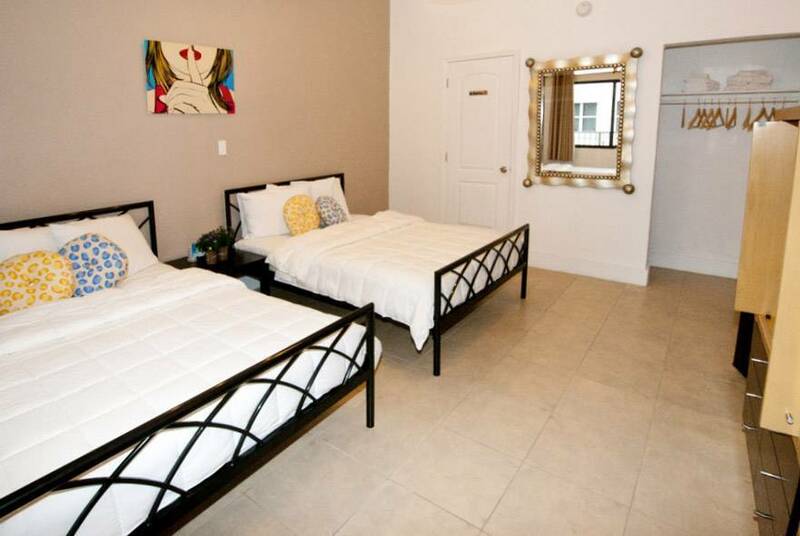 1 mile from the ART & Design center of Miami, leading art galleries, trendy restaurants and cafés, top designer clothing, furniture and antique shops. 20 minutes’ drive to the Aventura shopping mall. Walking distance from well-known bars, cafes, steak houses, and a variety of restaurants that give special pricing to Shalimar guests. Shuttle is available with charge from and too all the Miami ports. Reservation for the shuttle is required by telephone or online. There are 4 Public bus line with frequent stops (every 10 to 15 minutes) 24/7 just outside the Motel, that go across the city Miami. We are 1 mile from I-95. 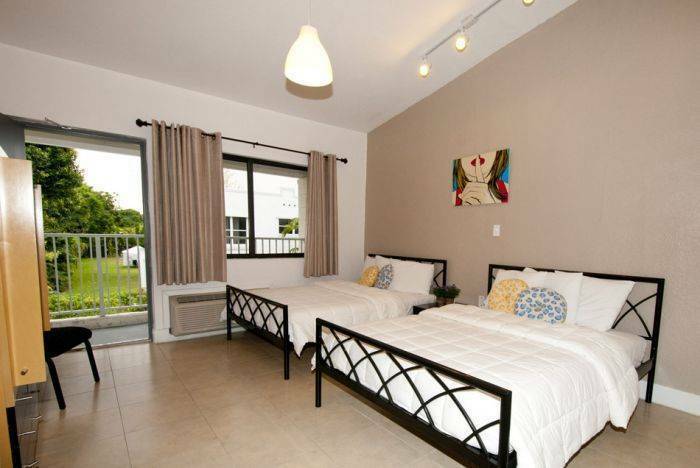 Nearest airport: 6 miles from the Miami International Airport and the Port of Miami.